Which installation did the Israeli bombing raid in Syria target? Which installation did the Israeli bombing raid in Syria on September 6 target? That question has been been on the minds of quite a few pundits since news outlets began reporting on the night-time raid by Israeli jets deep in Syrian territory. At first, very little was known, as sources were uncharacteristically mum. Slowly, it became apparent that there was a nuclear angle, and a North Korean angle. Meanwhile, can we figure out from the available piece-meal evidence what precise location this raid might have targeted? An audacious raid on a Syrian target 50 miles from the Iraqi border was under way. […] The target was identified as a northern Syrian facility that purported to be an agricultural research centre on the Euphrates river. 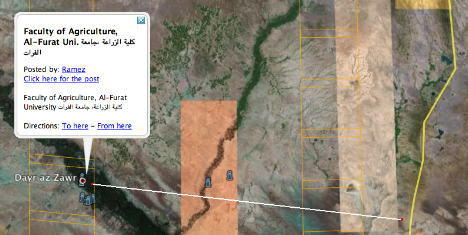 Hounshell then extended a line 50 miles from the border along the Euphrates on Google Earth. 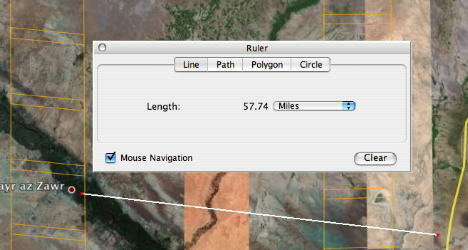 The line ended in Al Mayadin, which alas is not in high resolution. Hounshell’s thesis was that an area of interest to western intelligence would have been imaged by the likes of DigitalGlobe, and that it would therefore be in high resolution in Google Earth. Because Al Mayadin wasn’t, Hounshell felt that his speculation was likely wrong. I too went looking for the possible location, and found a good candidate, but didn’t feel there was sufficient circumstantial evidence to back up my speculation. Until tonight. Hounshell was closer than he thought. What did I do? I triangulated three pieces of information. 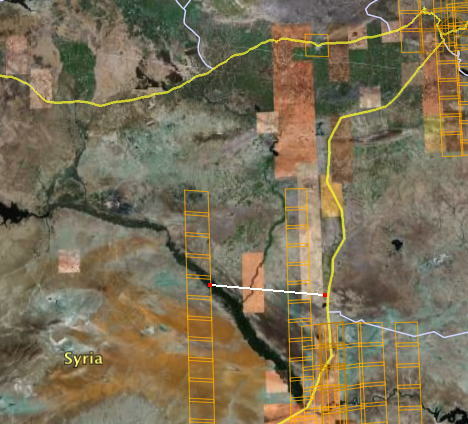 Putting these two pieces of information together, it looked like there was indeed a region about 50 miles from the border on the Euphrates where DigitalGlobe imagery had recently been taken. 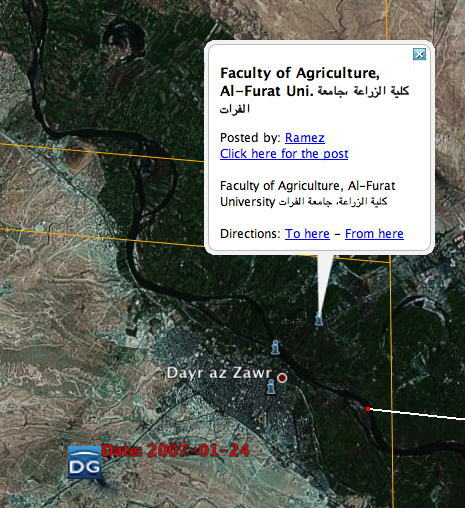 This latest article doesn’t mention agriculture (and nevermind that Dayr az-Zwar is not really “in the north” of Syria) but the ensemble of information I think now makes a pretty good case the the place that was bombed was a research center of Al-Furat University’s faculty of agriculture in Dayr az-Zwar. 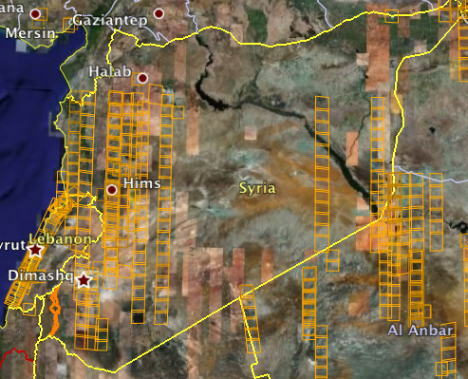 I was surprised while reading today’s coverage to learn that [Israeli tabloid] Yediot Aharonot actually hires the Digital Globe, a commercial spy satellite, to photograph Syrian and Iranian military installations. Apparently they’ve been doing this for years. Previous PostLinks: Hasselblad2KML, OZ house numbers, Xplage, Google Sky orreryNext PostSocial Google Earth, anyone? What’s the relationship between the DG Coverage rectangles and imagery in GE? For an area in Iraq (Talafar), I turn on each DG yearly layer and see rectangles, but the imagery hasn’t changed in several years. It doesn’t look like any of the DG coverage for the last 6 years, for this area, has made it into GE. So, will the 2007 layer make it into GE? If so, when? I’ve just posted the location with a link to the before and after photos. Any body know how much a raid like this costs the US taxpayer.In the past planes,training and munitions were paid for by the US TAXPAYER.These days even the aviation fuel is subsidised by the American taxpayer.